In addition, the EU produced nearly 900 million litres (2%) of beer which contained less than 0.5% alcohol or had no alcohol content at all. Two-thirds of the beer containing alcohol produced in the EU came from six Member States. Germany was the top producer in 2017 with a production of 8.1 billion litres (or 20% of the EU total production). In other words, about one in every five beers containing alcohol produced in the EU originated from Germany. Germany was followed by the United Kingdom (5.6 billion litres produced, or 14%), Poland (4.0 bn litres, or 10%), the Netherlands (3.9 bn litres, or 9%), Spain (3.6 bn litres, or 9%) and Belgium (2.4 bn litres or 6%). 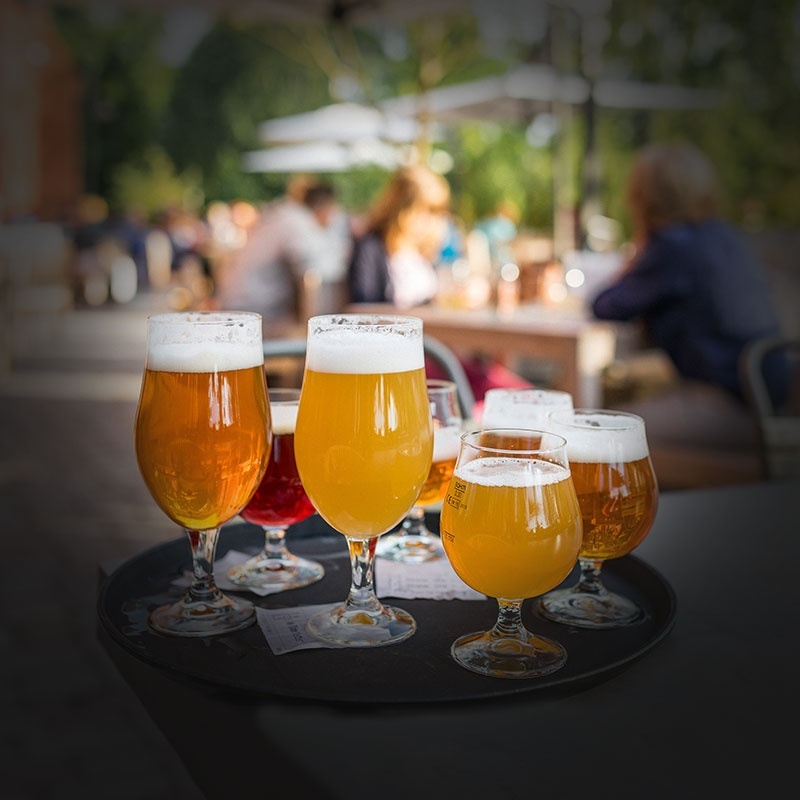 The Netherlands exported 1.9 bn litres of beer containing alcohol in 2017. 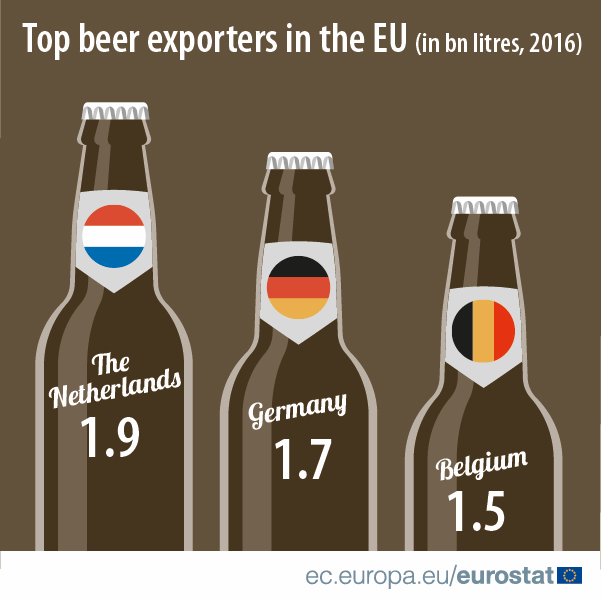 This made it the largest beer exporter of all EU Member States, ahead of Belgium and Germany (both 1.6 bn litres), followed by France (0.7 bn litres) and the United Kingdom (0.6 bn litres). The United States was by far the main destination for beer exports to non-EU countries (1.1 billion litres of beer containing alcohol exported there in 2017, or 31% of total extra-EU exports of beer). The United States was followed by China (520 million litres, 15%), Canada (210 million litres, 6%), Korea (175 million litres, 5%), Russia (138 million litres, 4%), Switzerland (111 million litres, 3%), Australia (100 million litres, 3%) and Taiwan (95 million litres, 3%). The internal market for beers containing alcohol that are not produced in the EU is marginal. However, when importing from non EU-countries, EU Member States favoured Mexican beer (211 million litres, or 52% of all extra-EU imports of beer in 2017), ahead of Serbian beer (48 million litres, 12%), US beer (39 million litres, 10%), Belarusian beer (23 million litres, 6%), Chinese beer (16 million litres, 4%), Ukrainian beer (11 million litres, 3%), Russian beer (10 million litres, 3%) and Thai beer (9 million litres, 2%). This news item marks today’s World Beer Day.